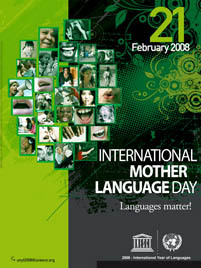 The tenth International Mother Language Day (IMLD) today, 21 Feb. 2009, marks the end of the International Year of Languages (IYL). As part of the observation of IMLD and the ending of IYL, a revised version of the UNESCO Atlas of the World’s Languages in Danger was unveiled on 19 February. It includes an online, interactive version. Yesterday, 20 Feb., there was a panel marking IMLD and ending IYL. As we draw to the end of 2008 – which is designated as, among other things, International Year of Languages (IYL) – I wanted to ask what’s next? And to propose the possibility of an International Decade of Languages to follow up on issues that the IYL dealt with as well as some others. A year is a short time to do much more than raise awareness, achieve some limited project results, and begin to link and expand networks interested in such a vast topic as languages. Is it time to prepare the rationale and plans for a longer term campaign? Highlight the situation of languages that are not on lists of endangered languages like the Red Book, but are contracting or not being developed for education and advancement of their first language speakers. Explore how the languages of the least powerful regularly get less attention in education and development, than those of the more powerful, even when significant numbers of speakers are involved. Related to the above, consider the importance of languages in achieving the Millennium Development Goals, the objectives of the UN Literacy Decade, etc. Discuss how to develop language policy and planning worldwide, on country, regional and global levels. Consider the importance of language education for individuals and in regard to other goals of education and language development. Develop an official International Declaration of Linguistic Rights for ratification by the UN and the world’s countries. Explore how localization of ICT and application of human language technologies can impact language preservation, development, arts, and learning. Consider whether, how and when to adopt an official international auxiliary language (or to just let English continue to evolve into this role de facto). There is a little bit of time yet to consider such a concept before the end of the IYL – which was officially launched on the last International Mother Language Day (21 Feb. 2008) and will officially close on the next (21 Feb. 2009). Should proclamation of an International Decade of Languages be a recommendation to come out of the IYL experience? What about the “Declaration of Linguistic Rights”? There are probably not many people who have heard of the Universal Declaration of Linguistic Rights (UDLR). The whole concept of linguistic rights is not widely known or discussed outside of some “MINEL” (minority, indigenous, national, endangered, local) language communities and language experts and activists. During this International Year of Languages, and with an upcoming Symposium on Linguistic Rights in the World (Geneva, 24 April), it would seem to be an ideal moment to ask where we are going with the UDLR and the whole concept. The story behind the UDLR apparently is that it was initiated in September 1994 by the International PEN Club’s Translations and Linguistic Rights Committee and the Escarré International Centre for Ethnic Minorities and Nations, and culminated with its adoption at the World Conference on Linguistic Rights held in Barcelona on 6-9 June 1996. UNESCO was asked for its support, and apparently accorded it. However the UDLR has not been ratified by the UN General Assembly and does not have the status in international law that something like the Universal Declaration of Human Rights (UDHR) has. However, this is not quite the same as – or at least does not have the same emphasis as – “linguistic rights,” which concern individual and community rights to use a language. Hence the motivation to write something like the UDLR. The point is perhaps clearer in considering the extreme opposite – “linguistic genocide” – which refers to deliberate efforts by a government or power to prevent, limit, and ultimately eliminate the use of a specific language, and may be regarded as a type of cultural genocide. There is an interesting discussion of the latter and international law in the advanced version of an expert paper on children’s education and human rights prepared for the upcoming 7th Session of the Permanent Forum on Indigenous Issues (21 April-2 May in New York). The paper was submitted by Lars Anders-Baer (prepared in cooperation with Ole Henrik-Magga, Robert Dunbar and Tove Skutnabb-Kangas) and entitled “Forms of Education of Indigenous Children as Crimes Against Humanity?” According to the authors, cultural genocide was not explicitly included in the Convention on the Prevention and Punishment of the Crime of Genocide (adopted by the UN in 1948, the same year as the UDHR) for various reasons. However the authors find that there are still ways that this international agreement can be used against cultural genocide, and linguistic genocide. Nevertheless it seems that while the field of international law and human rights is a complex and evolving one, there are some significant gaps when it come to languages. Specifically there are apparently no explicit protections of linguistic rights such as proposed in the still unofficial UDLR of 1996. But is the ULDR the best way to fill these gaps? One expert suggested that it might need a rewrite before it could hope for international ratification. But there has to my knowledge been no such discussion. It would be a shame if the International Year of Languages were to pass without any serious consideration of picking up this initiative. Every child should have the right to identify with her original mother tongue(s) and have her identification accepted and respected by others. Every child should have the right to learn the mother tongue(s) fully. Every child should have the right to choose when she wants to use the mother tongue(s) in all official situations. At the very least, perhaps this short formulation and the longer UDLR could be publicized more in order to help raise awareness about linguistic rights issues. The International Year of Planet Earth (IYPE) is another of the several “Year” observances declared by the U.N. for 2008 (I previously mentioned the International Year of Languages [IYL], and will come to the others later). It actually runs from 2007 through 2009, but had its formal launch at UNESCO on 12-13 February 2008. IYPE is described as “a joint initiative by UNESCO and the International Union of Geological Sciences (IUGS)” which involves “[t]welve Founding Partners, 26 Associate Partners and a growing number of International Partner organisations from all continents and representing all major geoscientific communities in the world,” as well as about 70 national committees. The International Year of Planet Earth aims to ensure greater and more effective use by society of the knowledge accumulated by the world’s 400,000 Earth scientists. The Year’s ultimate goal of helping to build safer, healthier and wealthier societies around the globe is expressed in the Year’s subtitle ‘Earth science for Society’. The International Year runs from January 2007 to December 2009, the central year of the triennium (2008) having been proclaimed by the UN General Assembly as the UN Year. The UN sees the Year as a contribution to their sustainable development targets as it promotes wise (sustainable) use of Earth materials and encourages better planning and management to reduce risks for the world’s inhabitants. This is clearly a substantial and well-organized effort, with important potential benefits in terms of public awareness, organizational networking, and longer-term outcomes. When considering IYPE and IYL, it is tempting to contrast the resources and planning, but without going into that, the differences seem to derive mainly from IYPE having had a kind of consortium in place fairly early in the process. I think this is an important lesson for the success of any “Year” observance: to have a dedicated organization that can help coordinate observance and activities. I’ll return to this topic later. I’m also tempted to see potential connections between IYPE and IYL – how can the two themes be linked in specific ways to enrich the impact of each?